I have been set a slightly longer animation task, 5-10 seconds of a random theme: mine was a cornish pasty. Each person must use the person before them's final frame to start their own animation, so that collectively the animations run smoothly together. The person before me was animating sushi, so that was my starting point. I have drawn 50 frames so far, which is about half-way according to my plan. So far it is looking good! I drew guidlines for the rolling pin part to try and keep it in proportion, and it was extremely helpful. All that remains now is to drop the meat into the pastry, wrap it up, and make it explode for banter. 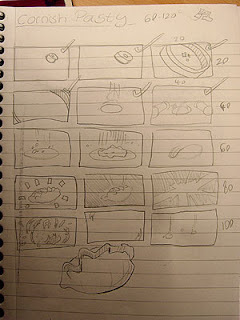 This is the very simple plan I sketched out for my animation.